I introduced the brand back in March and you can read about it here. In short, Enavose hails from Switzerland. The brand prides itself in using unique and high-performing actives and containing no parabens, no SLES (Sodium lauryl ether sulfate. 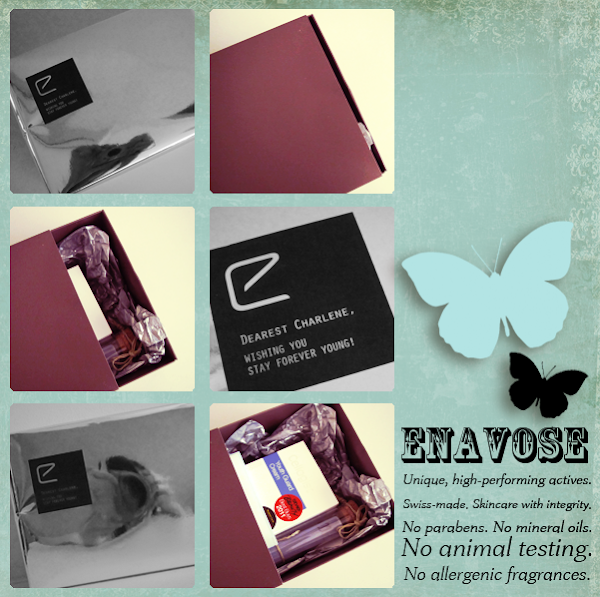 ), no mineral oils and no allergenic fragrances. Also, there is absolutely no testing done on animals. 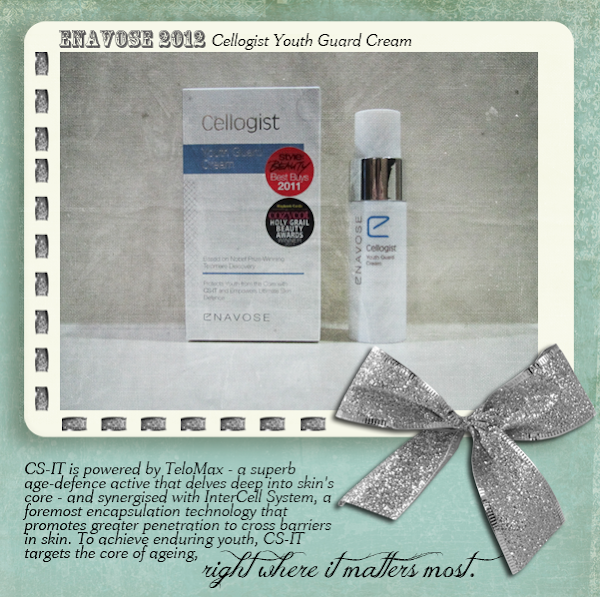 Inside my parcel, held Enavose's Cellogist Youth Guard Cream. This skin elixir won Style: Beauty's Best Buys 2011 and is also CozyCot's Holy Grail Beauty Awards winner last year and I was only too excited to try the cream! Right now, you may be thinking that 'Oh! This product is for mature ladies... (WHY IS CHAR USING IT?!?)' but as the saying goes 'Prevention is better than cure.' and this cream is perfect for ladies of all ages! 20's: Prevents the first signs of ageing such as fine lines and maintains skin firmness. 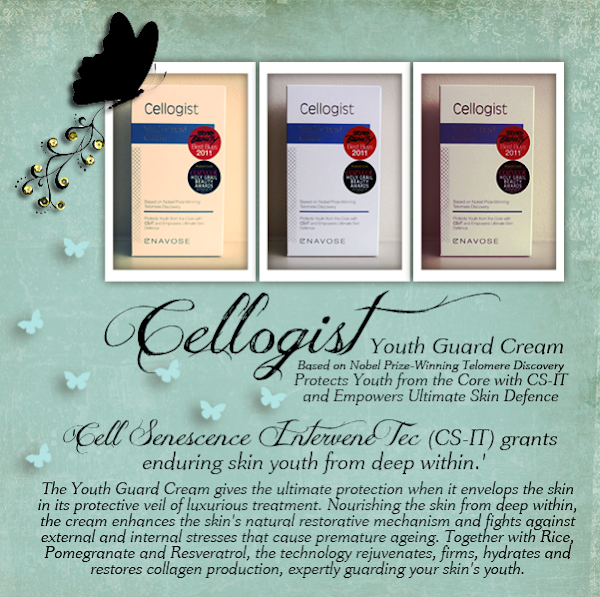 30's: Reinforces the youth genes in skin to combat fine lines, early wrinkles and loss of elasticity. 40's: Intense skin repair to diminish fine lines and wrinkles, while boosting suppleness and radiance. 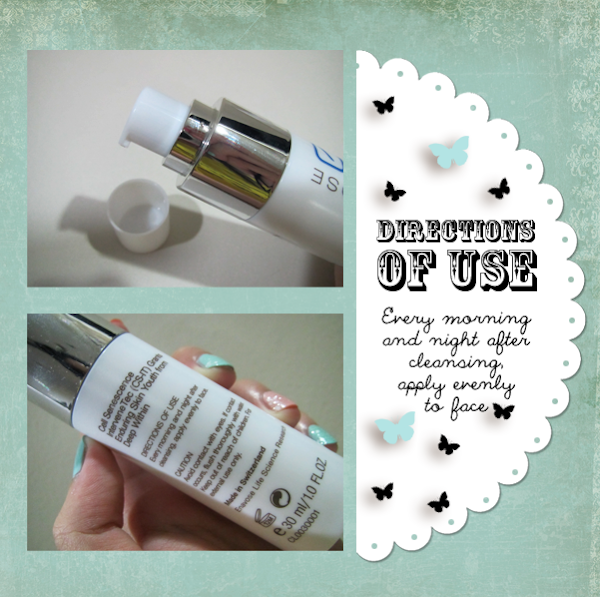 The 30ml white, opaque bottle comes with a pump from which the cream can be dispensed. The pump allows you to dispense the amount that you need easily. Hygiene is taken care of as there is no direct contact with all the cream so thumbs up for packaging! The bottle is pretty small and light, and this means that it's very convenient to take it along when you're flying the skies. The white cream comes out thick and opaque. It has a very pleasant floral scent, which I think helps to relax me before I sleep (Floral scents and me go very well together. *nods*). I apply the cream onto my face after cleansing and applying toner. I use half a pump in the mornings and a full pump at nights (I now sleep with artificial coldness because SG is like a gargantuan oven.). The cream is pretty lightweight but it feels a little greasy. It may be a little too rich for those with oily or acne-prone skin, so you might want to look somewhere else. I apply the cream to my forehead, cheeks and chin, avoiding my nose which is the oiliest part of my face. After about one and a half week of application, my skin feels more hydrated and plumper. I can't really comment much about wrinkles right now, given that I'm still young (AHEM.). BUT one thing which I noticed and am extremely pleased with is that my cheeks look rosy! Simply spend $100 to qualify for one chance in the lucky draw. Multiple entries allowed, with accompanying purchase of min $100. Results will be revealed on 11 May, 2012. Winners are allowed to pick one date within the month of May for their spa and high tea session. They are only allowed to bring their mum/ daughter to redeem the prize.